Approximately 25,000 grizzly bears live in Canada. They range from British Columbia and Alberta to the Yukon, the Northwest Territories, Nunavut, and the northern part of Manitoba. They’re big and, surprisingly, eat mostly plants and berries. However, they’ll feed on salmon and small mammals when they’re available. 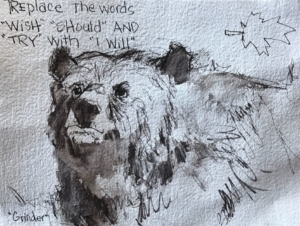 And this is a drawing of the grizzly I had lunch with today at the 5-acre wildlife preserve that’s located at the top of Grouse Mountain in Vancouver, Canada. I did the drawing with a new flowing ink pen. Since I didn’t have any brushes with me, I just used water and my fingers to do the shading. 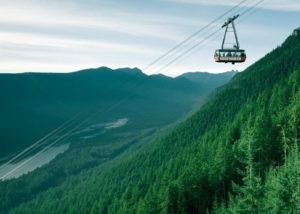 Grouse Mountain rises more than 4,000 feet above Vancouver. There’s a Super Skyride that takes you to the top. The views from the skyride are jawdropping. You can not only see the city sprawled at the foot of the mountain and the Pacific ocean and inlets to the west, the skyride skirts the top of thousands of unadorned Christmas trees … otherwise known as Douglas firs … that blanket the mountainside. 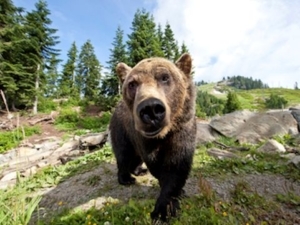 The wildlife refuge is home to two orphaned grizzly bears, Grinder and Coola. This one is Grinder. Now we’re on our way to cruise Alaska!